"I religiously read Bill Gross of PIMCO"
Bill Gross: Can capitalism function efficiently at the zero bound? No. The reason nominal growth is critical is that it allows a country, company or individual to service their debts with increasing income, allocating a portion to interest expense and another portion to theoretical or practical principal repayment via a sinking fund. Without the latter, a credit-based economy ultimately devolves into Ponzi finance, and at some point implodes. Watch nominal GDP growth. In the U.S. 4-% is necessary, in Euroland 3-4%, in Japan 2-3%. where the narrative only works if everyone gets $200 in cash on every rotation around the board. And without banks creating new loans and injecting money into the broader economy, economic activity grinds to a halt. This 40-year period of time has been quite remarkable – "a grey if not black swan event that cannot be repeated." In his just released monthly letter, "Bon Appetit! ", he provided some additional insight on why he has become so bearish on credit instruments. investment grade bond markets have provided conservative investors with a 7.47% compound return with remarkably little volatility. and ever lower interest rates over the past 30 years, a condition he thinks will not repeated again. He then goes on to explain why the "carry" trade will no longer provide the kind of returns investors are used to. When the Fed’s crisis-fighting policies end, Mr Gross’s bets may turn out to be correct. It is also possible that fundamentals will start to shape markets more forcefully – allowing bond investors to intimidate governments again. But, as John Maynard Keynes observed, the problem with markets is that they can remain “irrational” longer than investors can stay solvent – or than eccentric investment gurus can command respect. In that sense, then, Mr Gross is a potent symbol of a distorted investment world. an expansion of credit beyond the bounds of a central banker’s imagination. – a return that leveraged banks and lending institutions have based their income and expense budgets on. A bank can no longer borrow short and lend two years longer at a profit. While Democrats favor tax increases and mild adjustments to entitlements, Republicans pound the table for trillions of dollars of spending cuts and an axing of Obamacare. Both, however, somewhat mystifyingly, believe that balancing the budget will magically produce 20 million jobs over the next 10 years. the very gravity of the consequences if the ceiling isn’t raised, they say, ensures that in the end politicians will do what must be done. and the urgent need for President Obama to draw a line in the sand against further extortion. forcing governments to promote leverage and asset price appreciation in order to fill in what is known as an “aggregate demand” gap – making sure that consumers keep buying things. Our economy’s lights, if not switched off in a rehash of the 1930s Depression, have certainly been dimmed in a 21st century version likely to be labelled the Great Recession. McHouses, McHummers, and McFlatscreens, all financed with excessive amounts of McCredit created under the mistaken assumption that the asset prices securitising them could never go down. There is a developing optimism that we can go back to the lifestyle of yesteryear. While policymakers, including the President and Treasury Secretary Geithner, assure voters and financial markets alike that such a path is unsustainable and that a return to fiscal conservatism is just around the recovery’s corner, it is hard to comprehend exactly how that more balanced rabbit can be pulled out of Washington’s hat. Private sector deleveraging, reregulation and reduced consumption all argue for a real growth rate in the US that requires a government checkbook for years to come just to keep its head above the 1% required to stabilise unemployment. Five more years of those 10% of GDP deficits will quickly raise America’s debt to GDP level to over 100%, a level that the rating services – and more importantly the markets – recognise as a point of no return. The fact is that supply-side economics was a partial con job from the get-go. Granted, from the 80% marginal tax rate that existed in the US and the UK into the late 60s and 70s, lower taxes do incentivise productive investment and entrepreneurial risk-taking. But below 40% or so, it just pads the pockets of the rich and destabilises the country’s financial balance sheet. Bill Clinton’s magical surpluses were really due to ephemeral taxes on leverage-based capital gains that in turn were due to the secular decline of inflation and interest rates that at some point had to bottom. We are reaping the consequences of that long period of overconsumption and undersavings encouraged by the belief that lower and lower taxes would cure all. To understand modern Republican thinking on fiscal policy, we need to go back to perhaps the most politically brilliant (albeit economically unconvincing) idea in the history of fiscal policy: “supply-side economics”. 2½% real yields cannot possibly be maintained unless deflation as opposed to inflation becomes the odds-on favourite. What bond investors know as “breakeven inflation rates” are currently signaling a future where the US CPI averages -1% for the next 10 years. I'd say you got to buy TIPS. Legendary bond investor Bill Gross sees slower growth and a stock market driven by yield rather than capital gains. Still, he's not hiding in Treasuries. Bill Gross oversees $790 billion at asset manager PIMCO, more than the gross domestic product of most countries, and has posted impressive returns. Lately the King of Bonds is sounding grim. He expects slower U.S. growth, lower corporate profits and a lower standard of living for years to come. The damage from this Wild West of capitalism…is irreparable…When you lose half your 401(k) you care more about the return of your money than return on your money. The lack of animal spirits will influence investing for years to come. The government will have to play risk taker of last resort. The banking industry has been nationalized. People don't realize that. There are so many programs. It's hard to keep up. but it has a flaw: it is inherently unstable. beyond the $700 billion rescue plan being contemplated by Congress, said Pimco founder Bill Gross. because of incompetence, excessive greed, and in minor instances, fraudulent activities. What is good for Ambac, the bond insurer, is good for the country. Well, perhaps in the short run if it prevents a run on the shadow banking system. But not in the long run. is at the center of the problem. from hedge fund managers in mid-August. has in recent years become famous for issuing downbeat warnings about the credit world. This month, however, his tone has turned positively apocalyptic. to bail out American homeowners struggling with sub-prime mortgages. The shadow banking system of hedge funds and CDOs, CLOs, PIPES, etc. – explain things to a public and even yourself in terms of what can be easily understood. that now appear to be unwinding. They were created by youthful financial engineers trained to exploit cheap money and leverage who showed no fear and who have, until the last few weeks, never known the sting of the market’s lash. They are wizards of complexity. I, however, having just turned 63, am a professor of simplicity. The significance of proper disclosure is, in effect, the key to the current crisis. Financial institutions lend trillions of dollars, euros, pounds, and yen to and amongst each other. In the U.S., for instance, the Fed lends to banks, which lend to prime brokers such as Goldman Sachs and Morgan Stanley which lend to hedge funds, and so on. The food chain in this case is not one of predator feasting on prey, but a symbiotic credit extension, always for profit, but never without trust and belief that their money will be repaid upon contractual demand. When no one really knows where and how many Waldos there are, the trust breaks down, and money is figuratively stuffed in Wall Street and London mattresses as opposed to extended into the increasingly desperate hands of hedge funds and similarly levered financial conduits. These structures in turn are experiencing runs from depositors and lenders exposed to asset price declines of unexpected proportions. In such an environment, markets become incredibly volatile as more and more financial institutions reach their risk limits at the same time. Waldo morphs and becomes a man with a thousand faces. All assets with the exception of U.S. Treasuries look suspiciously like every other. But should markets be stabilised, the fundamental question facing policy makers becomes, “what to do about the housing market?” Granted a certain dose of market discipline in the form of lower prices might be healthy, but market forecasters currently project over two million defaults before this current cycle is complete. The resultant impact on housing prices is likely to be close to -10%, an asset deflation in the U.S. never seen since the Great Depression. 70% of American households are homeowners, and now many of those that bought homes in 2005-2007 stand a good chance of resembling passengers on the Poseidon – upside down with negative equity. A 10% “hook” in national home prices is serious business indeed. It’s little wonder that Fed, Treasury, and Congressional leaders are shifting into high gear. Bill Gross, manager of the world's largest bond fund, is everybody's go-to guy when it comes to reading the tea leaves about Federal Reserve policy and the potential direction of interest rates. Lately, though, the manager of the $94-billion PIMCO Total Return fund has found himself making some off-the-mark projections. A year ago, he pegged 10-year Treasury rates going no higher than 4.5% during the next three to five years. They are now 5%. the stimulative effects on asset prices and growth are still part of the current environment. if done too quickly or moved towards restrictive territory. Although the “stability” produced many inherent disequilibriums including the U.S. consuming 80% of the world’s excess savings reflected in an $800 billion current account deficit, there seemed nothing impossible about this mission, I suppose. And there’s nothing improbable about its continuing either until China/Japan are in closer proximity to their destinations – China to eventually have a self-sustaining, internally demand balanced economy and Japan to have permanently exorcised the D word from its lexicon. We at PIMCO are of the persuasion that the “Yen carry trade” embodied in 0% borrowing rates by Japanese individual and global institutional investors has been a significant factor in the compression of yields and risk spreads in almost all financial markets. As their 0% rate morphs now into something higher, financial markets will feel the impact. And as speaker Charles Gave pointed out, an economy dependent on asset appreciation which in turn is dependent on low yields, is more vulnerable than one based on income. Observera i diagrammet ovan att USAs senaste överskott i bytesbalansen uppnåddes 1992, när den svenska ekonomin var nära sammanbrott när Bildt- regeringen med stöd av Ingvar Carlsson m fl, m fl, försvarade kronkursen. US have a large trade deficit. It cannot go on for ever. When it stops the dollar will drop. It is disturbing that the only time US had a near zero deficit was in 1992 and the dollar was low against the swedish krona. I religiously read Bill Gross of PIMCO. I particularly enjoyed this month's piece. Gross is talking to his clients about the problems of bond investing. Given that he sits on top of the biggest pile of bonds in the world, I find it always useful to pay attention to him. It’s in chapter 6 that the gang really becomes its most imaginative. "The U.S. Capital Account Surplus!" in the face of a 300 basis point uplift from the Federal Reserve. a rate that was only 50 basis points shy of the cyclical tightening peak of 6½% in 2000. Because the U.S. economy has evolved into a highly levered finance-based economy, it stands to our reason that this modern day version is more sensitive to changes in interest rates than those of years past. PIMCO has for several years now focused on the real interest rate – Fed Funds minus inflation – as the most legitimate indicator of neutrality. "The Strange Tale of the Bare-Bottomed King." Future finance-based consumption is limited by our ability to keep pumping lower and lower yields, which in the past have led to higher and higher TIPS, home, stock, and associated asset prices. Age does have some benefits if only in knowing what not to do if given a second chance. We always want more of everything so how could there ever be a lack of "aggregate demand" in this magic kingdom? The historical textbook example of this malady probably first appeared during the depression of the 1930s when what Keynes labeled as capitalism's "animal spirits" were so dampened that corporations and consumers sat out the dance, preferring to hide their money in a mattress instead of risking it in a transaction during a deflationary spiral. In their place, government became the buyer of last resort. It isn't prudent for U.S. citizens to continue to expect to consume 6% more than they produce, nor is it rational for investors to expect foreign central banks - primarily the Chinese and Japanese - to invest that 6% surplus and other direct investment monies into the U.S. Treasury market forever. At some point it comes undone, either through a massive revaluation and dollar decline, a Treasury buyer's boycott, or a whimpering U.S. consumer beaten down by the cost and/or amount of their burgeoning leverage - much of which is housing related. Nearly everyone knows that oil prices, housing prices, and even stock prices are up in the past few years and in some cases spectacularly. Not everyone knows why. 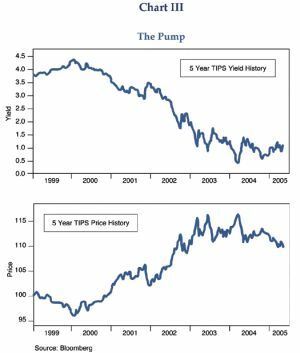 can best be explained via the price action of a good old inflation protected Treasury, a 5-year maturity TIPS shown in both yield and price terms in Chart III. our King's seamstress as having done a rather poor job of sewing. That seems evident because her creations have been put together not based on savings and domestic investment but on finance-based consumption fed from asset appreciation based on the Pump. Future finance-based consumption, however, is limited by our ability to keep pumping lower and lower yields, which in the past have led to higher and higher TIPS, home, stock, and associated asset prices. If we had to forecast (and we do), we believe a range of 3 - 4 1/2% for 10-year nominal Treasuries will prevail during most of our secular timeframe and that yields on Euroland bonds will be slightly lower due to their structural unemployment problems, disinflationary incorporation of new Central and Eastern European countries into their existing family of nations, and more growth-inhibiting demographics. and by extension, overstating GDP and productivity. - about "an important article by Pimco's high-profile portfolio manager Bill Gross"